Spurs’ defense remains off-tune in fourth straight road loss. 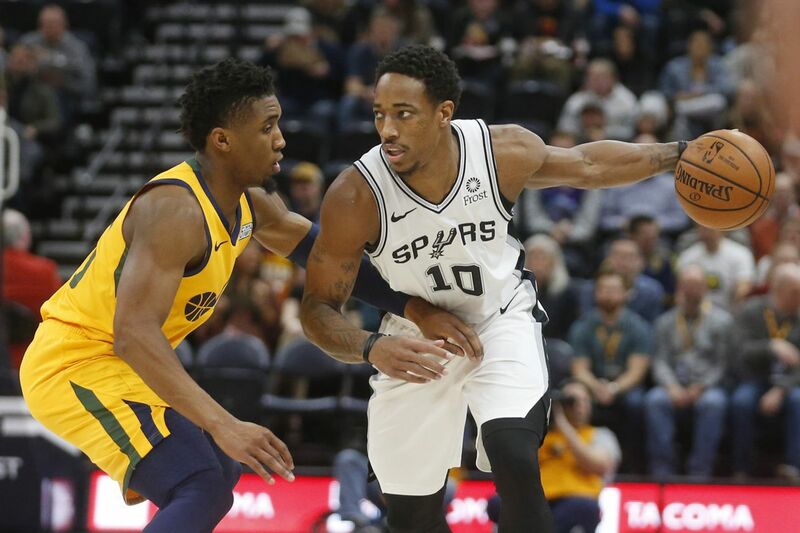 In their fourth stop of the Road Road Trip, the San Antonio Spurs (32-25) took on the Utah Jazz (31-24) in a Saturday afternoon tilt at Vivint Smart Home Arena. Rudy Gay (out with a sprained ankle) in his comments on the team’s woes thus far, stated Friday that “I guess we were at home and we were on a high and I guess we thought we would come on the road and play the same kind of game.” In light of the win-less start to the trip, and amidst ongoing injury issues with our lead wing players, along with San Antonio’s 34 point loss here in December, better execution and sustained effort were the main hopes for today. Joe Ingles, while defending him, made contact early on with DeMar DeRozan’s head, knocking him to the ground for an entire Jazz possession. Despite Pop’s repeated calls for an intentional foul, it ended in a rare short-handed stop! It’s worth mentioning yet again that DeRozan absorbs a highly inordinate amount of contact-related non-calls for a player of his stature and accomplishments. LaMarcus Aldridge asserted himself in the first quarter with two assists and a turnaround jumper, while Bryn Forbes nailed two left-side jumpers to pace the Spurs. In a sequence that shows how much Rudy Gobert’s presence affects a game, his block of a Marco Belinelli drive led to two made free throws seconds later. Aldridge countered with his own block of Gobert at the rim along with a completed alley-oop. Thorn-in-the-Spurs-side Ricky Rubio came out in the second period pairing a reverse lay-in with back to back alley-oop feeds to Derrick Favors, to net seven quick Jazz points. Meanwhile, Davis Bertans showed off his expanded repertoire with a block of Favors at the rim followed by a pull-up 3. Just as the Spurs have proven adept at developing low draft picks and little-known free agents, the Jazz leveraged timely play by Royce O’Neale (three 3-pointers) and Raul Neto (two assists) to wreak offensive havoc on San Antonio in the second period. Utah rode 52% shooting, 27-16 rebounding advantage, and a 26-10 points in paint disparity to a 62-48 lead at the half. Rubio and Donovan Mitchell exploited the Spurs’ lack of a consistent stopper to a torrid Jazz start in the third while Jakob Poeltl scored a few baskets and DeRozan’s resurgent outside shooting kept the team within some distance. For Jakob, could it have been the ham and corn pizza he prefers which fueled him on International Pizza Day? In an homage to how fundamentally sound these two teams are, the Spurs (11-11) and Jazz (10-10) combined to shoot 100% from the free throw line in the third period and San Antonio managed to shave down the deficit to 11. In a sequence that has exemplified how difficult transition defense has been on this road trip, a Forbes miss on a drive led to Bryn and Pau Gasol trailing the action on a Jazz fast break – which resulted in an open Ingles corner three to extend Utah to its biggest lead of 17. My wife yelled “we really need Manu Ginobili” at this point. Mark Barrington asserted earlier today that San Antonio’s defense is noticeably worse this year. It would appear that, at first glance, a significant increase in turnovers contributes to the porous defense. Based on NBA Stats’ team turnovers data, the Spurs’ team rankings going back to 2003-2004 are: 1st (this season), 4th, 10th, 4th, 11th, 9th, 11th, 3rd, 9th, 10th, 1st, 5th, 5th, 8th, 10th, 13th. This brings up the following questions: is this just a small sample size of turnovers on this particular road trip, are opponents ‘smelling blood in the water’ and becoming more galvanized to score more points off turnovers, and lastly, have the Spurs been this great at protecting the ball during this era because we had the Big 3 (and Kawhi Leonard, Danny Green, and others patrolling the perimeter) and its ‘corporate knowledge’ in place to limit forced turnovers? It’s worth noting that Green – he of the Chasedown Block specialization – ranked in the top 50 in blocks the last six seasons. Did you know that the Jazz court and uniforms were inspired by the natural beauty of Southern Utah and the Delicate Arch adorns the center court? Did you also know that the line going down the left side of Utah’s uniforms represents the highway between Salt Lake City and St George? Well, now you do! The Spurs, after falling to a ghastly 10-19 on the road, get a brief respite from their Road Road Trip back in San Antonio before heading east to Memphis for a Tuesday night match-up with Mike Conley and the Grizzlies at 7:00 PM CDT.